Ahh crud! I am so totally paying for that hard run that was supposed to be an LSD run on Sunday. My hip wasn’t quite screaming at me, the last two days, but it did have some wince-inducing tenderness going on. Oh yay (note the sarcasm)! And the worst part of all, I know that there could very well be some “I told you so(s)” going on when we all meet again tomorrow. Yay (again, note the sarcasm)! Just a wee bit of wincing is all. But luckily for me, I’ve got a great massage therapist who was able to squeeze me in at the last minute on my way home from work. But because he could only fit me in for 30 minutes, not the 45 I usually opt for, I had to lay down the law: No unnecessary talking, I told him. He’s great at his job, great at kneading out the muscle kinks, but he is also an incessant talker, and hasn’t yet mastered the art of multi-tasking. Good news: the pain at this point is nothing to worry about, he said, just a slight tightness in my thigh, right at the point where the IT band connects with the glutes, and just a slight jamming of said thigh halfway up my back – just. The second he said IT, though, I was freaking out. “Noooo, not the IT,” I pleaded. (If you haven’t guessed, I’ve had IT issues in the past) but he said pretty much everything connects to the IT, there’s no avoiding it, and this is just real slight, nothing to worry about. I’d be good to go for a run tomorrow, he assured me. But not today. On my own accord, I took the day off from running. I didn’t want to further aggravate what was going on, so I figured it would be a good time to take a second rest day of the week. 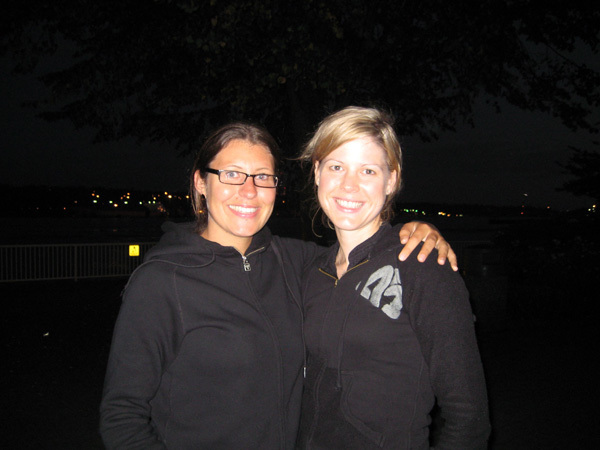 And instead, I spent the night catching up with an old girlfriend of mine, who I first met when we were impressionable “cool” campers at Camp Elphinstone on the Island. The year was 1993. Dazed and Confused and Menace to Society were in teenage VHS players across the board, and Christian Slater and River Phoenix were plastered to the walls of teenage girls everywhere. And at Elphinstone, Kristal and I were inseparable – we were, and I quote, “Sk8er Buds” Like I said, we were so “cool” 😀 And after years of writing letters back and forth (this was before the time of email) and then losing touch, and then regaining touch, we now live like 10 minutes apart! Yay! Love having a friend so close to home! Discovery of the day: Just two months until Marathon Day! Thank you Mario for the freak out reality check! I won’t rub salt in the wound by saying “I told you so!”, I think you have learned your lesson. 🙂 See you at Mill Lake. FOAM ROLLERS SAVE LIVES. Seriously, magic.